There is a very famous Chinese saying: "You are thousands of miles apart but you come together because you have YUAN between you. You face each other but you don't know each other because you don't have YUAN between you." Chinese like to say that YUAN is an invisible thread that connects people. The term "YUAN" is from Buddhism. It's hard to find an equivalent word in English. The closest word to explain it may be FATE. YUAN is one of the most important ideas in Buddhism. It represents the connection, chance and influence between things. That's why people have the idea of invisible thread. YUAN can be good or bad. Buddhists encourage people to study Buddhism, be kind to others, and benefit society in order to start a broad and good YUAN. So when Chinese talk about YUAN, they mean good YUAN. If you have YUAN, you become a family, friends, classmates, colleagues, and neighbors. You have YUAN with the people who worship at the same temple. You have YUAN with your doctor. You have YUAN with the people who travel in the same train or boat. Some Chinese like to say that a relationship has to be cultivated for at least 500 years before it blossoms. This saying shows their appreciation for the relationship because it is not easy to wait for 500 years. If a man marries a woman, there must be a red thread, YUAN, connecting them. The invisible red thread also connects the loving parents, wherever they are in the world, with their waiting baby until they become a family. YUAN is also called YUAN FEN. If a boyfriend and girlfriend break up, if a couple divorces, or if a family member dies young, people would say that the YUAN FEN between them was not enough, or ended. It is wise to let nature take its course if the YUAN FEN ends. Otherwise, one of them or both of them will be hurt. There are some nice stories related with the invisible red thread. One story is about an old man under the Moon, who puts the red thread between a future husband and wife. Therefore, the matchmaker gets a nickname: "Old Man under the Moon". 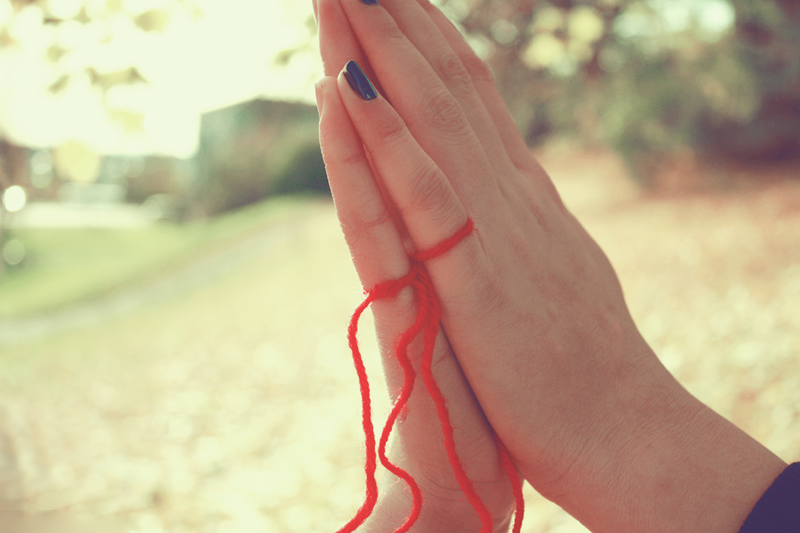 One old story featuring the red string of fate involves a young boy. Walking home one night, a young boy sees an old man (Yue Xia Lao) standing beneath the moonlight. The man explains to the boy that he is attached to his destined wife by a red thread. Yue Xia Lao shows the boy the young girl who is destined to be his wife. Being young and having no interest in having a wife, the young boy picks up a rock and throws it at the girl, running away. Many years later, when the boy has grown into a young man, his parents arrange a wedding for him. On the night of his wedding, his wife waits for him in their bedroom, with the traditional veil covering her face. Raising it, the man is delighted to find that his wife is one of the great beauties of his village, and he notices she wears an jewel on her eyebrow. Asking her why she wears it – she replies that when she was a young girl, a boy threw a rock and it struck her on the eyebrow and left a scar. The woman is, in fact, the same young girl connected to the man by the red thread shown to him by the old man back in his childhood. They were connected by the red string of fate.